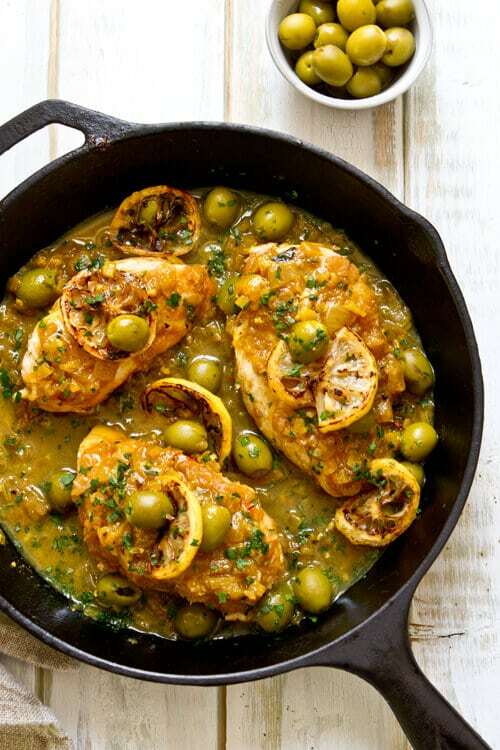 One Pan Moroccan Lemon Olive Chicken… and the olives behind it! Do you ever stop to wonder who is behind that can of tomatoes, pineapple or olives you pick up in your local grocery store? I have a confession to make. I generally don’t either – and I’m “in the food business”. But one of the benefits in writing this blog is that sometimes you have an opportunity to “peek behind the curtain”. In this case, I got a “peek” behind both the Lindsay and Early California labels, attending a dinner hosted by the California Olive Committee. Over a delicious dinner at Marino Ristorante (which featured olives of course!) I learned a bit about how olives, a childhood favorite, are grown, harvested, cured and canned. But the best part was meeting one of the growers – Jorge and Julia Inestroza the 4th generation to operate Tenalu Ranch in the foothills of the Sierra Nevada. We talked about the all the things that impact the quality of an olive – from soil, to weather, to irrigation. I thought I was passionate about olives – but the Inestroza’s take that to a whole ” ‘nother level.” It was clear after 5 minutes in their company that they are incredibly passionate about growing the highest quality olives. 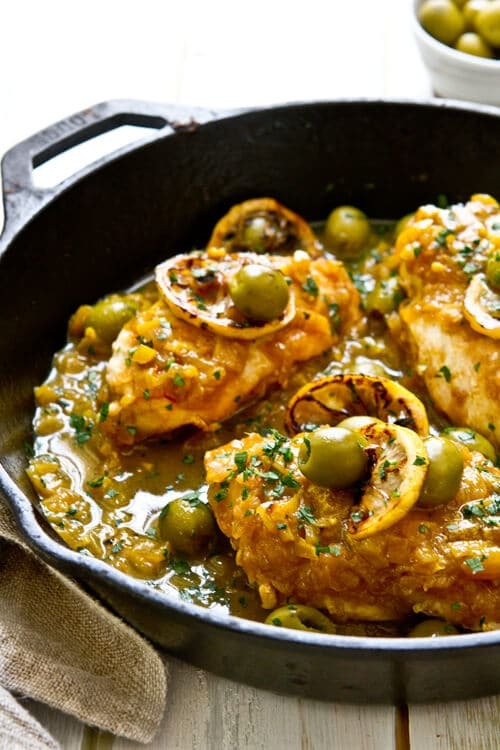 Which probably explains why California Ripe Olives are still a favorite… even after all these years and why I am “passionate” about eating them – especially in dishes like this One Pan Moroccan Lemon Olive Chicken! After that dinner I was on a bit of an olive kick and decided to re work one of my favorite recipes using olives – Djej M’Chernel – a moroccan dish of chicken with lemons and olives. Like many traditional recipes, this dish has many variations and each household has their own version. I’ve been making a version from Paula Wolfert’s the Food of Morroco for years. The original dish calls for a whole chicken (or in my case, pieces) that are rubbed with a spice mixture and left in the fridge overnight. Traditionally cooked in a tangine, it is a wonderfully flavorful and fragrant chicken dish that combines two of my favorite flavors – lemons and olives. Since I’m notorious for not planning ahead though, I wanted to streamline the dish into one that I could easily make on a weeknight, no advance planning needed. This One Pan Moroccan Lemon Olive Chicken is the result. With all the flavors of the original, it satisfies my craving – no need to plan ahead! Remember to serve it over couscous or rice to sop up all those tasty olives and sauce!!! If you don't have preserved lemons, don't worry - the dish is still great without them. * Saffron water: Dissolve 1 pinch of saffron threads in 1 Tablespoon of warm water. Pat the chicken breasts/thighs dry with a paper towel. Set aside. Heat a large saute pan with a lid over medium high heat. Add the lemon slices and cook until slices are caramelized. About 3 minutes. Remove the lemon slices and reserve. When the oil is shimmering, add the chicken breast/skin side down. Cook for 3- 5 minutes until chicken is browned. If chicken releases easily from the pan, it's ready to turn. Turn chicken and cook until remaining side is browned. Add remaining 1 Tablespoon of olive oil to the pan. Add the onions and cook, stirring frequently, until the onions are soft and translucent - about 7 minutes. Add the garlic, ginger, paprika, cumin and turmeric, cinnamon and pepper. Add the saffron water and regular water. Stir, scraping up the brown bits on the pan. Add the chicken pieces back to the pan. Remove the lid and add the olives, preserved lemon and fresh lemon juice. Garnish with the lemon slices and fresh parsley. Nancy, that’s a beautiful dish! 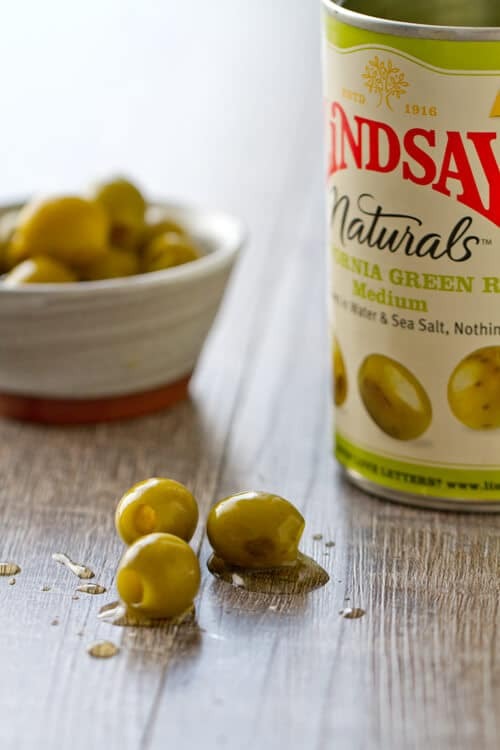 We love olives, too, and your spices are balanced and not overdone; one could actually still taste the lemon, olives and chicken. And I can certainly appreciate the streamlining! Awww… thank you!! Spices are challenging, aren’t they? It really depends upon how fresh they are as well as one’s own tastebuds!! Perfect while I deal with my expensive and broken oven – a bounty of Meyer lemons here and always chicken in the freezer. HI, I am wondering where to find Saffron water? Not sure I have seen that anywhere . . . is it something you make from scratch with saffron? ah, I see it there, sorry . . . This was amazingly delicious! I just wish it hadn’t been 98* outside while I was cooking! It was worth it though! Great recipe. This dish looks wonderful. Are you using boned-in or boneless chicken breast? Hi Gail! You can use either bone in or boneless for the recipe. As for the cooking time, I found that my thighs were cooked in about 20 minutes. However, the thighs had been out of the refrigerator for 30 minutes – if you start with cold chicken thighs the cooking time will be closer to 25 minutes. Very fast and with a lot of flavours dish! The olives are so good combined with spices and juicy chicken! I am so glad you enjoyed it Alice!!! Do you think I could use chicken drumsticks instead of thighs/breasts in this recipe? I apologize for the delay in responding – I was out of the country and I just realized none of my emails were delivered – gah! You absolutely could use drumsticks in this recipe – just adjust the cooking time accordingly!! What is preserved lemon and where would I find it? Hi Randi! Preserved lemons are basically lemons that have been stuffed with salt and packed in a jar. After a few weeks, the rind becomes very soft and the salt has leached out the bitterness – and it’s the rind that you use> I have a “how to” on my website here – Preserved lemons . You can generally find them in middle eastern markets but they are so easy to make (about 5 minutes of work!) I make my own. Now, since they do take a few weeks to make (and you may not want to wait that long to make the lemon olive chicken) you can substitute the zest of one lemon – it won’t have quite the same punch as the preserved lemons, but the dish will still taste delicious!!! I noticed the picture has a clear liquid base, but all of the liquid water I added absorbed as soon as I added it to the onions. Just wondering if I missed something? Thanks! Was your heat set to high? If so, the water could have evaporated very quickly if the pan was really hot! There isn’t a huge amount of sauce – about 1 Tablespoon per chicken breast – just enough to add some moisture! We haven’t tried your version yet. So I have a a question or two. To begin with we lived in Morocco many years ago for 2 years. It was a great learning experience. I made preserved lemons last year with Meyer lemons. I also purchased a Tangine dish from W&S last year. It’s pottery so no direct heat. Do we start with an iron skillet and then transfer to the Tangine dish? I am so very jealous – what a fabulous experience!!!! So to adapt the recipe to use a tangine! I would sear the chicken quickly and then saute the onions in a skillet and then transfer to the tangine. I would also probably add the lemon juice at the end. If you like a more pronounced spice flavor, you could increase the spices by 1/4 teaspoon. I like mine with a bit more spice, but wrote the recipe with a bit more restraint since I know not everyone loves those flavors as much as I do! I’d love to hear how the tangine worked for the recipe since a tangine is on my wish list!! !